Easter comes early this year. 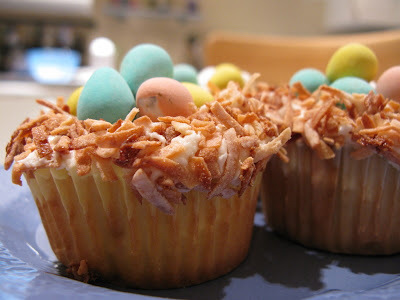 I realized that I hadn't done any Easter baking so I decided to remedy that last night with a batch of Bird's Nest Cupcakes. They're delicious, easy to prepare and almost as fun to look at as they are to eat. All that and they give you the perfect excuse to buy the family sized bag of Mini Eggs. What more could you ask for? Here's the recipe if you want to try them at home. Heat the oven to 350. Spread the coconut evenly over a cookie sheet with sides. You'll need to toast more than you'll use because it needs to be deep enough to dredge the cakes. I used all of a small bag, about 2-3C. Toast the coconut for approx 7 min, but keep an eye on it, it turns quickly. Also, you'll notice that the coconut around the edges of the pan browns much faster than the rest. Every 2 minutes or so, stir the browned coconut into the middle of the pan. Keep a close eye on it. Once cooled, spread a cake with a generous layer of frosting. Dredge in coconut. I found I had to pack on a little coconut afterwards to get good coverage. Once covered, take the end of a spoon and push the frosting/coconut out of the middle of the cupcakes towards the sides. This will create the sides of the nest and importantly, will keep the mini eggs from falling off. I scraped the frosting right down to the cake to form a little well about a centimeter across. 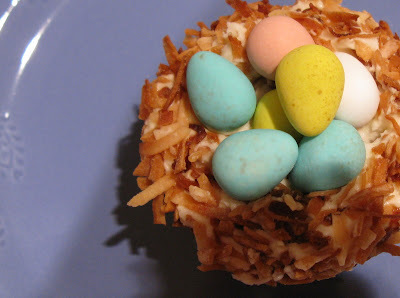 Place a few mini eggs into the nest. I found that 5 or 6 eggs per cake worked best. Repeat. I came across this tonight and decided it was interesting enough to take a shot at. Any guesses what it is? Would it help if I told you I found it in my kitchen? It's a mini M&M immersed in water, an unintentional drowning victim of my somewhat overzealous brownie making. (There's just something about eating warm brownies will commenting your way through America's Next Top Model with a couch full of friends.) The coating melted right off and lay suspended in the water. Of course, the logical next step after getting this photo was to dump in some more M&Ms to see what happened. I imagine this is what a candy store might look like if you were on acid. Got to love that one last M&M hanging on to its dignity, refusing to disrobe while all around him the crowd throws caution to the wind. I thought it was Smarties that always had the red ones go last. It seems far too early to be springing forward, but I am never one to quibble with extra sunlight. I am thrilled that the days of driving home in the dark are over for another year! We decided to take full advantage of the season and headed outside for a nice walk through Aldergrove Bowl. I had no idea this park was just down the road. Now that it's lighter later I have some exploring to do. We have to put up with a fair deal of rain around here, but this is the pay off -- new green leaves in early March. Even the rocks are green. We had a great walk (although we all missed Amanda who was home sick :( Along the way I got a camera lesson. The larger the number, the smaller the aperture, the shallower the depth of field. Good info for taking portraits when you want the background to just disappear. I was listening, but looking at my photos when I got home turns out I didn't practice that too much today. Ah well, lots of time left for experimenting. Lastly, this is the photo that I meant to post last week. Last Saturday was the funeral for Kennedy Olivia. During the day, I kept thinking about them and in the afternoon looked outside to see this huge rainbow right in my own backyard. Rainbows, it turns out are rather tricky to photograph but I caught a glimpse of it anyway. What a beautiful reminder that God's promise stands, even on the very sad days. Roll on Spring, I'm ready for some more sunshine.